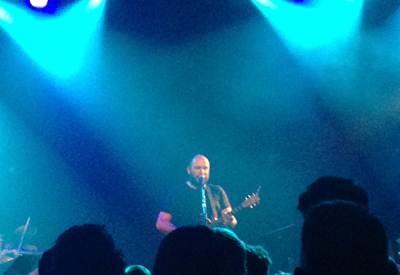 David Bazan, best known as the guy behind Seattle, Washington 90’s band Pedro the Lion has been a lyrical hero of mine since I heard his mournful, intricate narratives as a depressive 20-something year old (over 10 years ago!). Specifically, I first heard “June 18, 1976” (a narrative about a young single mother who commits suicide by jumping off a building) on a mixtape an ex-boyfriend made me and the lyrics stopped me in my tracks like no other song has done since. The first and only time I’ve seen Pedro the Lion was back in 2004 at the Horseshoe. Ten years ago! This show at the Mod Club was something special, something to behold. Bazan was backed by the Passenger String Quartet, with which he has recorded new versions of his solo songs and Pedro the Lion songs and released as a Volume 1 album (meaning there are more to come!). So, as if the original tunes weren’t depressing enough, these new versions with strings are even more somber and haunting, if that’s possible. Particularly arresting are the string quartet-backed versions of “Priests & Paramedics” and “Bands With Managers” (in which Bazan interjects a line from “June 18, 1976”). But what picture does the above passage paint for the “impromptu” Ra Ra Riot show this night? a) We waited for a bit – set time was said to be 830pm but the first note was played at 9pm, giving my fellows enough time to annoy me. b) The club filled up slowly, giving lines of sight from butts to AC. But in the end it was a good turn out – definitely at capacity by the second song. c) All kinds of people came out on this broiling night. When a friend who has been their fan since before she could dance mentioned about Molson Amphitheater, my mind did a double-take. I had no idea Ra Ra Riot was that popular. Since this particular concert was not well-publicized and yet it filled the theater, you might reason that it consisted entirely of offerings from their new album The Orchard. After all, promotion is the name of the game here. Not so. Although I have yet to sample the new CD, they opened with St. Peter’s Day Festival, and connected through songs like Ghost Under Rocks, Can You Tell, and Dying Is Fine from their first album The Rhumb Line. Interspersed between those immediately recognizable selections from the old are, I presume, the new songs. I have not seen them since SXSW 2009, but they have definitely grown up. The energy all 6 band members radiated was the most memorable part of their, or perhaps any, show at Austin that year. This time their stage presence, while lacking somewhat the exuberance of yesteryear, is far more polished. The performance still carried with it the feeling of six friends rocking-out in the basement (perhaps they were also tired from the bigger showcase yesterday? ), but there was certainly less garage band antics and more purposeful exchanges of looks, smiles, and headbutts. Wes Miles displayed more showmanship than at the Parish – hugging band-mates, cheering them on, and generally interacting playfully to the audience. I do miss their more expressive and meandering songs like Oh La, but I’m sure that’s merely the nature of this particular show. Their pace is always even with the recordings, and all of the instrument voices sound crisp and clear. I thought Miles’ voice has become brighter since 2009. 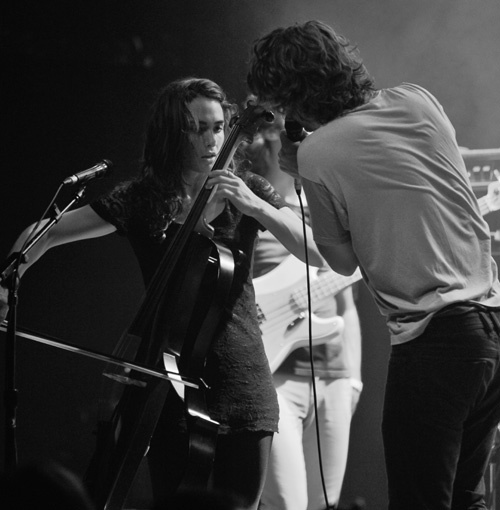 There are comments from the floor that most people were staring at either the cello or the violin… but that’s a positive note illustrating how their music is conducive to mellow and sanguine thoughts. (Btw, is it me or they have a new drummer?) At the end of each piece, the entire theater would dim to denote the transition – which in a sense addressed my comment last time that theirs songs can feel like one giant stream. To summarize: Ra Ra Riot is still a riot to watch. And the next time they show up in Toronto (I heard December?) we’ll still be there. Toronto – “TO-RON-TO. How’s it going?” These are the trite-sounding words that came out of the lead vocal when he walked on stage on a Tuesday night. But it was actually quite helpful for me. Over the opening, Dougy’s proclamation slowly sank in and I realized that I am now clearly not in Austin. If you read my first review, Temper Trap, hailing from Melbourne Australia, was the hidden surprise for 3/4 of us at Cedar street courtyard – and I’m sure if Alli was there she would have agreed with us anyways. Trying to play catch-up to the rest of the world (who has probably heard them since last September’s 500 days of summer), I read up a little on their bio-sketch, and I must apologize for labeling Dougy a Philippino last time – he’s from Indonesia (man my childhood Indonesian neighbors would be mad if I tell them… ) He moved along the Indonesian islands, eventually to the biggest one downunder. Starting out by busking and drawing portraits, he rolled up some good friends like a katamari, and they eventually turned into band-mates Toby (drums), Jonny (bass), and Lorenzo (guitar). There’s no time lost in setup – they got up and started to play on the dot, following a fast-fast-slow tempo for the setlist. I think the more pop-ish Fader was first, then mood-building Rest, and the slower and lighter-drummed Fools. Resurrection was followed by Down River, which picked the speed right up, and then when I said Solider On was a good song precisely because it’s a slow one that showcases Dougy’s falsetto, some guy immediately contradicted me. While I fumed the crowd stomped/clapped through Love Lost into their most-played song, Sweet Disposition, from which there was a natural tempo into the crazy Drum Song. This nice album showcase was interrupted by 60 sec of clapping and 60 more sec of “one more song/tem per trap”. They started the encore with a bluesy acoustic vocal verse, and then transition into their typical chorus that I didn’t recognize, and returned to the album, playing Science of Fear as the swan song. The lighting at Mod club, as usual, was spectacular – it can probably make yours truly look good enough in a photo-shoot. The only gripe – I didn’t have my camera, and was kicking myself the whole time. For a band that’s four years old, Temper trap carried themselves very well indoors or outdoors – they simply do a little less jumping/climbing around if there’s no space. Their sounds is genuinely fitting for their demeanor. Dougy plays the heartthrob serenadeer, Lorenzo smiles while playing the guitar evenhandedly, Jonny invariably loses his hair-braid/pin towards the end of the show from violent head-shakes, and I can never see Toby unless I have my zoom lens. I could swear there’s a keyboard person at Filter party… although I didn’t see him this time. They also retained the sufficient-bass-is-good-bass principles – always a plus in my books. That setlist really is built to showcase their album, so there’s very little down-time in terms of crowd reaction. Having seen them twice in recent memory, however, makes some of their stage antics a little predictable (see here and add awesome photoshop backlight silhouette filter for the water drum). They don’t over-do it, though, so it’s all still very cool to watch – and hey, who’s counting, I bet they may be more tired of it than me. I’ve already covered which songs are the immediately good ones. If you go see them in NYC, bring a rain coat. I predict that they’ll just turn on the sprinklers during Drum Song.